Gallery of emotions for make-up visagistes and stylists. The shown physiognomic symbols can be applied by visagistes and stylists to identification of emotions, and also for a choice of emotional images of female faces. In essence shown physiognomic symbols can be patterns of make-up artists, as for creation of correct cosmetic appearance it is necessary to identify emotional expressions of facial features. Sad eyes - oppression of desire. The quiet mouth seems dismal as eyes and eyebrows express sad emotions. 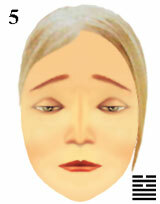 Sad eyes and eyebrows seem calm as the mouth expresses quiet emotions. Unhappy ideas are shown in eyes of the person and silent feelings seem dismal. The person understands impossibility of real desires and consequently feelings are silent. facial features for make-up visagistes and stylists.